The trio, who became face of 2016 JNU protests, rule out joining active politics, claim they will stick to academics and research. 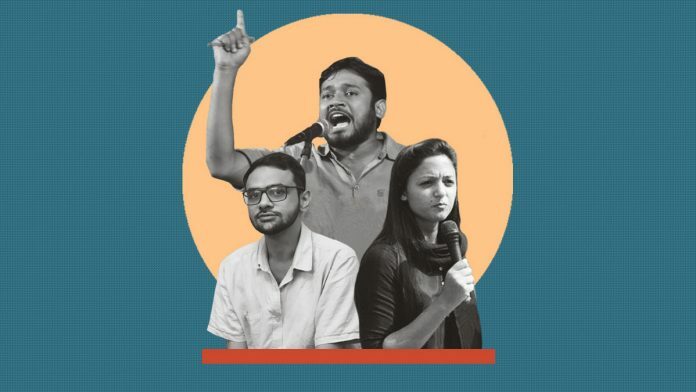 New Delhi: Student activists Kanhaiya Kumar, Shehla Rashid Shora and Umar Khalid — who became the face of the 2016 protests at Delhi’s Jawaharlal Nehru University that made national headlines — apparently have no plans to join active politics and will stick to academics and research. In the aftermath of the 2016 protest — which erupted on the anniversary of the 2013 execution of Parliament attack convict Afzal Guru — questions were raised about their studies and research. The three student leaders were even accused of wasting public money and pursuing their research in JNU for many years. Although the protest has largely faded from public memory, the three make headlines once in a while, leading to speculation that they might soon make the switch to politics. All three, however, are serious about academics and will continue to pursue a career path they chose before they made headlines, ThePrint has learnt. Former JNUSU president Kanhaiya Kumar, who along with Khalid was jailed on sedition charge for participating in the 2016 protest, has gone back to his hometown Begusarai in Bihar where he wants to take up a teaching job. Earlier in September, there was speculation about Kumar contesting the 2019 Lok Sabha election from his home state. Kumar has done his PhD in social transformation in South Africa in the post-apartheid period. “All talk about Kanhaiya joining politics is just a rumour. He is currently busy in activism and plans to teach at a college in his hometown,” Kumar’s friend Dhananjay told ThePrint. “He is looking for opportunities to teach and wants to remain in academia,” Dhananjay added. A sociology student, Kumar was enrolled in the Centre for African Studies, School of International Studies in JNU. Kumar’s PhD thesis, ‘The Process of De-colonisation and Social Transformation in South Africa, focuses on post-apartheid economic liberalisation in South Africa. “After completing his MA in sociology, he wanted to do research on the social demographics in South Africa…In his thesis, he has studied all policies made in South Africa from 1990 to 2018 and their impact,” Malakar explained. “His PhD thesis is important to understand the context of globalisation which happened post 1990 all over the world. In the context of his thesis, we can analyse the impact it will have on South Africa and India and the relations between these two countries,” he added. Shehla Rashid emerged as a prominent student leader for more than one reason – she was the first Kashmiri woman to occupy the JNUSU vice-president’s post, she was a good orator and was the face of protests against the arrest of Khalid and Kumar. Her speeches were taken seriously by supporters of free speech in and outside the campus. An NIT Srinagar graduate, Rashid was always interested in technology and policy, which is also the area of her PhD thesis. Once complete, Shehla plans to use her thesis for policy-making. She is currently working on the synopsis of her thesis, ‘How algorithm based decision-making affects fundamental rights”, that is likely to focus on topics such as Aadhaar and cyber policing. “I will look at three examples from India for my case study, one of which could be Aadhaar. It is an example of how algorithm can affect policy decisions,” Rashid told ThePrint. “In the United States, the research on this subject is at a very advanced stage. But in India it is a new thing,” she explained. Khalid did his PhD on the tribals in Jharkhand. Through his PhD thesis, ‘Contesting claims and contingencies of rule: Singhbhum, 1800-2000’, Khalid has tried to study the tribal history in southeast Jharkhand comprising East and West Singhbhum districts to explore how the Naxal movement thrived in this belt. According to Umar, he got interested in the subject after he joined JNU. “When I joined JNU, there was a lot of discussion happening on the Maoist movement,” he told ThePrint. “People like Arundhati Roy, Gautam Navlakha and others were writing on it, so I got interested in knowing the history of the movement,” he said. “What I discovered during my research is that the rebellion goes back to the colonial period…the pattern of pitting locals against locals has remained consistent as a state policy,” he said. He said there is a misconception that tribals are a community which is in tune with nature and that the arrival of the state is differentiating their livelihood. “However, that is not true. Otherwise how would you explain something like Salwa Judum (a movement led by local tribal youth to counter Maoist violence in Chhattisgarh)?” Khalid asked. “There is a conflict and hierarchy within the tribals is what I found during my research,” he explained. Umar claims his PhD thesis is relevant in current times. “Because of the current political dispensation, not many students are coming forward to research on tribal movement and the Maoist movement although the number of students of Dalit history has gone up, which is a good thing,” he said. Apart from tribal studies, he also plans to work in the social sector in future. “I will continue to work in the field of tribal studies and do my activism but I have no plans to enter active politics,” he said. These students are the future of India. They have had the courage to stand up to the corrupt and fake nationalists of today, suffered the criminalisation of politics and are the hope of a democratic India. Their studies show the depth of their knowledge and engagement with Indian economy and sociology today that not of the fake nationalists come close to understanding. Salute their courage and commitment to India. This kanhaiya idiot once told in TV that today’s youth is more equipted(it should be equipped).will he teach like this? What happened to this idiot’s PhD? What the hell they were doing while giving the slogans against India? Why they are now inclined towards the social causes and the overall scenario of India? What these people think about their daily lives? Are they really being more attentive towards their career or just for the entertainment? Why these bloody people want to be famous in this or the other way through the headlines? They are not only the ones to take on the research work in this JNU or any other universities. I want to kick and throw these people out of the country. Best wishes to all of them for all their future endeavours. Their thoughts, ideology n speach not against the national interest they can be allowed or put them in the jail prominently . Goes on to show how a fascist government does to effort to besmirch people who question there dubious policies. To date people raising slogans have not been caught, for the simple reason because they were planted there by government and later made them run away and the blame was put on the jnu elected students. Fake nationalists worried the students may expose them. Nation is more important than these …. At the very outset its absolutely a wrong notion that the protest in JNU complex in 2016 spear headed by these ‘3 idiots’ with their infamous slogan “Afzal hum sharminda hai tere kaatil zinda hai” & “Bharat tere tukrey karkey rahengey” has been erased from the people’s memory. The doctrine of ultra left & ultra Islamist with which their mindset has been poisoned against the nation, I frankly feel that whatever career they follow for their future I’m very sure that they will follow their careers in the interest of the nation. Because these are ‘Viruses’ which should be uprooted before they spread their demented ideology of anti-nation. Don’t you think its relevant that the court should decide if they even are rotten apples or tomotoes.